Teaching recorders can be a lot of fun (and so rewarding!) but it can also be pretty overwhelming (and headache-inducing! ), especially in the beginning when you're trying to cover the fundamentals. 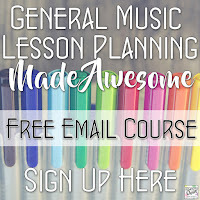 Once you've taken care of the logistics (read all of my tips for getting everything set up in this post), it's time to get those instruments into the students' hands and start playing! 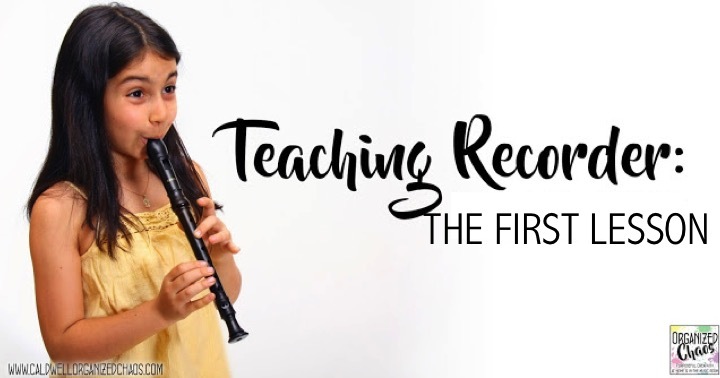 Today I want to share how I get everyone started on the right foot and excited about the recorder on the first day. My #1 rule when I teach any instruments in class is this: "if you play before I say you'll make the instrument go away". The same policy applies with recorder- even more so, in fact. There's nothing worse than a stray toot on the recorder in the middle of giving directions. 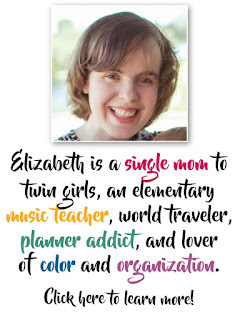 I make it very clear from the beginning that I do not distinguish between accidental and purposeful playing when I haven't told them to play- no matter what the circumstance they will have to put their recorder away for the rest of class and play on their "air recorder" for the rest of the period. This may sound harsh but I quickly also teach them how to 100% ensure that they don't "accidentally" blow into their instruments by learning 3 holding positions: rest position, practice position, and play position. Rest position is for when I'm showing or telling them something- for this one they keep their recorders in their laps. Practice position is for when they are practicing their hand position but aren't ready to play yet- for this one they hold their instrument the same way as they would when playing but rest the mouthpiece under their chins instead of in or near their mouths. This is the most important skill for them to learn from the beginning- there is very little chance of them blowing into the instrument, even if they sneeze or cough, but they can still effectively practice their fingerings without making any sound or worrying about how they blow. We practice the 3 positions over and over again until they can do it quickly and quietly (with their left hands on top, although they haven't learned the exact finger positions yet). It turns into a game for them and helps set the tone from the beginning. I play a short melody for them on my recorder, and afterwards point out that the volume level I was just playing for them is the maximum volume the instrument can physically produce without sounding ugly. We talk about how the recorder comes from a time when all instruments were much softer, and is not intended to play as loudly as a saxophone or trumpet. I have my students echo me as I speak 4-beat rhythm patterns on the number TWO, using a quiet speaking voice the whole time, then they echo me on the word "two" again, but using a whisper voice. Once they have gotten the feel for how to blow softly, I have them echo me, still "whispering two", into their instruments. I have them hold the instrument with their left hand on top but tell them not to worry about whether or not they're covering any holes. One thing I find helpful for making sure students are in the habit of tonguing properly with a "t" sound is to do some rhythm patterns with fast notes like sixteenths. It's the best way to pick out the students who are blowing with a "hoo" sound and point out that they physically cannot play fast without using a "t" sound to tongue the note. When I show them a new note, I always turn around to face the same direction they are and show them that way, holding the recorder up and to the side so they can see what I'm doing- since I always mirror them for pretty much everything else we do in class, it is very confusing for them if I don't! One of the first things I point out to them is that the left thumb should be pointing out to the side when it covers the hole on the back, not pointing up towards the mouthpiece. This is the #1 problem I find with students who don't cover the holes completely! Once I have them place their fingers over the 4 holes they need to play a G, I have them squeeze down a little harder until they get marks from the holes on their fingertips. Then I tell them to check and make sure that a) they have complete circles, not partial circles, on each finger, and b) the circles are on the soft padded part of their finger, not the very tips near the nails (a common problem with kids who have some background with strings and piano). Once we have gone through all of that, I remind them of how to blow softly into the instrument, and I have them echo me on 4-beat patterns again, this time on G. While we do this, I walk around the class and physically move their fingers when I see they aren't covering the holes (always tell them you're going to do this beforehand of course)! There's been some debate amongst music teachers on this, but I am a firm believer in moving to low E after teaching G. I tried going with the methods that say to start on B, A, and G a few times, and found that a) it took students much longer to learn proper hand placement because the right hand had nothing to do, b) it was harder to break students of the habit of over-blowing because you can get away with blowing harder on high notes, and c) it was much harder to motivate students to work on those more difficult low notes later in the game- they're much more motivated to work longer at those hard notes when they're first starting (seems counterintuitive, but in my experience, consistently true). With that in mind, after I teach G, I show students how to play low E next. I always preface it by telling them that I'm teaching them some of the hardest notes first, so they shouldn't feel frustrated if they can't get it to sound good in the beginning. We repeat the same process I use to introduce the first note above. Usually I only have a handful of students who can play a nice low E in the first lesson, but by the next period they can usually all have at least partial success! I don't have students clean out their recorders. The reality is, most of the time with plastic recorders that have gotten the amount of play time they have in our short class periods, it's just not necessary, especially with drawstring cases like we have that are breathable. 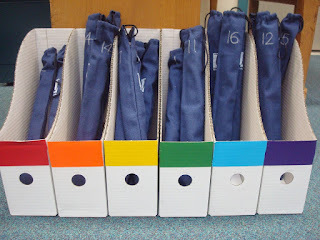 I have them put the recorders into the cases upside down (head joint at the bottom) and put the instruments in the corresponding box to match their color row. How do you start off recorders to get everyone started on the right foot and keep them motivated and excited? I'd love to hear your ideas in the comments! Want to get more content like this, see what I'm teaching each month, and get the latest updates sent straight to your inbox? Click here to sign up for the Organized Chaos newsletter! Thanks for the insight. I have been teaching recorder for several years and decided to start with G /E this year. It just seemed to make sense. Yours is the first blog I have read with the same thoughts. What notes do you teach after E/G? Working out new lessons.